This is a super cute Little Black Dress that follows on the trend of vintage Glam by showcasing a wonderfully charming sequin collar, which is a real eye catcher! This Mela Black Sequin Collar Short sleeve Dress is the ideal party dress this season, it’s cool and stylish and very trendy. 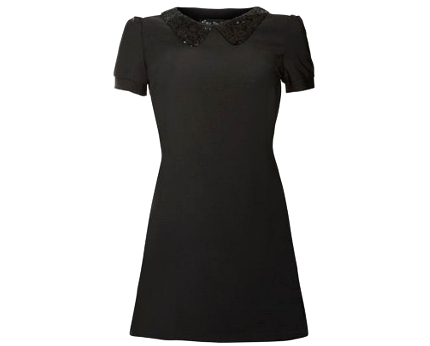 The short sleeves offer a cute vibe to your style, whilst the sparkly sequin collar offers a fashionable vintage feel. The shorter length to this dress adds to its lovely charm and makes this a real fun party dress whilst managing to maintain a classy feel about it. This super little LBD is incredibly versatile and can be worn with thick warm tights making it an ideal winter wardrobe dress for this season but restyled and worn with bare legs for a cute summery look. Make sure you add some killer heels to elongate your legs and achieve the most flattering results!